Pocket Logbook is designed by pilots for pilots. The goal behind Pocket Logbook is to eliminate the expensive subscriptions now required for most logbook programs while giving you full access to your logbook on the go. Pocket Logbook stores your logbook locally on your iPhone or iPad so you have access even when there is no internet connection available. – Look through logbook as either a spreadsheet or by each entry. – Print your logbook to any AirPrint enabled printer. – View your totals for filling out FAA 8710 form. 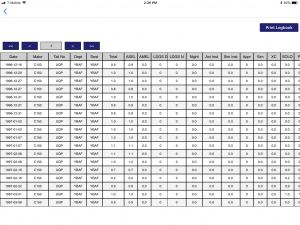 – Includes a second totals page with summaries designed specifically for filling out an AirlineApps.com application. – Universal App. You can use this on your iPad and iPhone. – You can now export your logbook to excel or another spreadsheet program. – Import from any .CSV file.